Not again. And again at home. 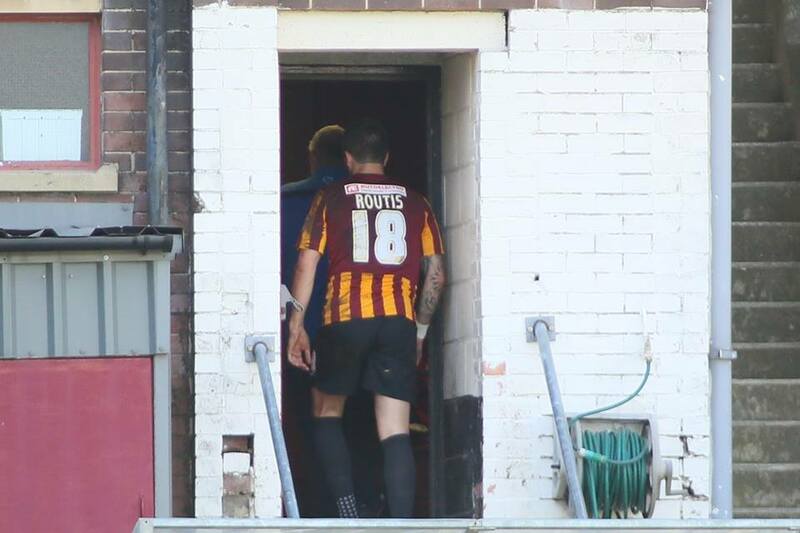 Valley Parade – the fortress? Not really. 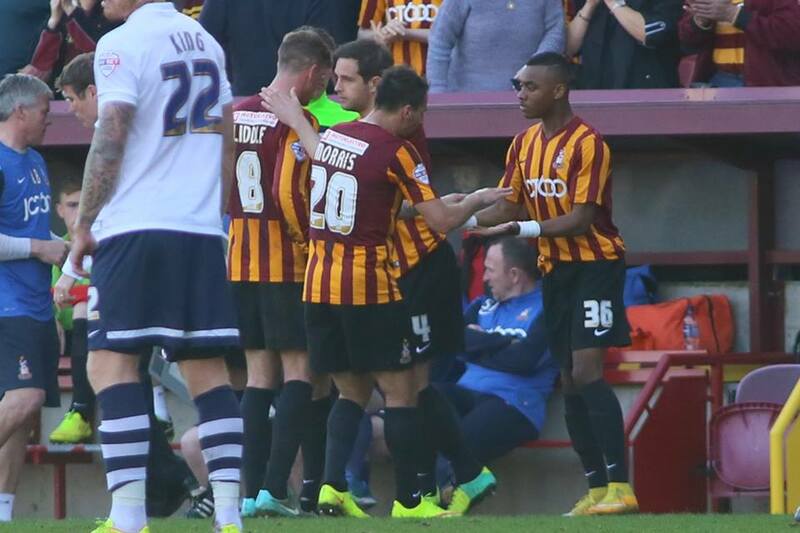 If City’s home form was anywhere near as good as the away form, the Bantams would be sitting happily in the play offs. 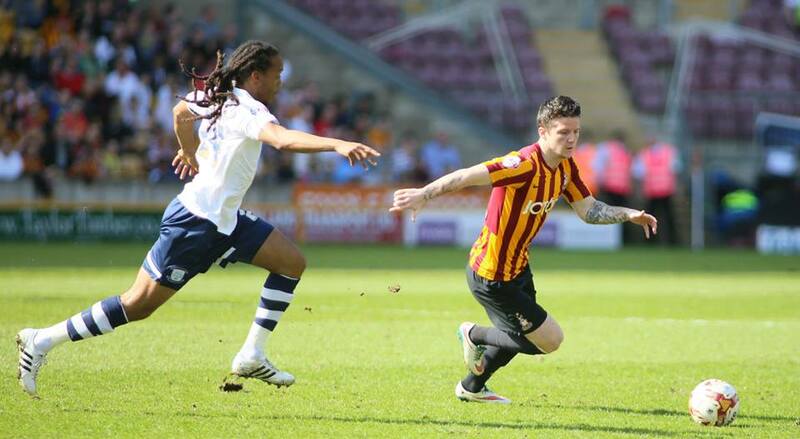 But there is something about playing at Valley Parade where it just does not happen. A glorious opportunity was missed yet again here. After the superb victory at Doncaster on Friday it was the reverse today, with City losing 3-0 at home to Preston. The scoreline did flatter the away side somewhat, but the damage was done after three key incidents: a Chris Routis sending off after 15 minutes, a Jon Stead miss after being put through on goal, and finally, barely seconds into the second half, a Preston penalty which started the goal feast. City came into the game with two changes; Routis in defence in place of the injured Gary MacKenzie and Jon Stead recalled with Billy Clarke pushed back into midfield at Mark Yeates’ expense. 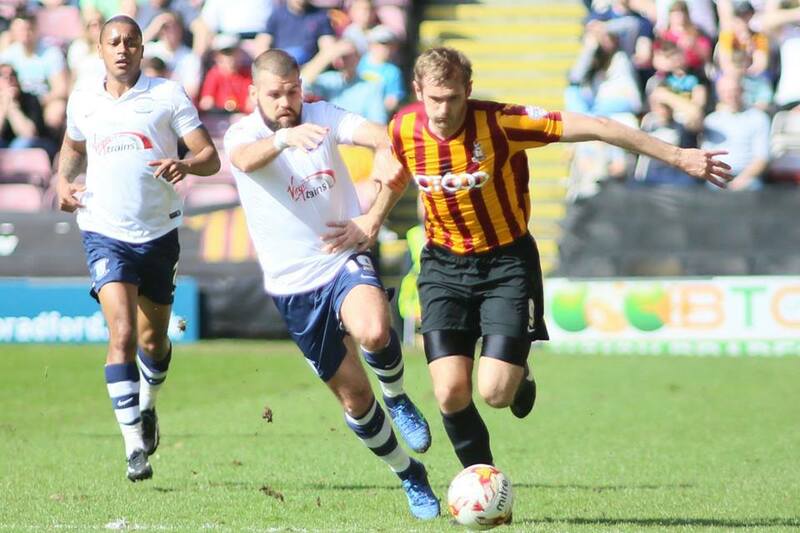 It was a crunch tie for both sides; Preston to consolidate their automatic promotion spot and for City to get back into the elusive sixth place position. Preston were not going to be easy opposition for City sitting second in the table on the back of a 12 game unbeaten run. Simon Grayson has a knack of managing promotion sides from Leeds to Huddersfield to Blackpool and he seems on a similar course with this current Preston team. The game started on a glorious Monday afternoon in Bradford with both sets of supporters in high spirits. The conditions were still not perfect, but some good dry weather helped the pitch seem far better than it has done. The pitch was not used as such in the early stages with passages of long balls and head tennis, as both teams tried to settle. James Hanson was proving a handful all afternoon for the Preston defence and linked up with James Meredith on the left side particularly well. The whole complexion of the game changed, however, as early as the fourteenth minute when a long headed clearance from the Preston defence downfield caused Routis to get the wrong side of Preston forward Joe Garner and commit the foul. He was the last man which resulted in a straight red card for the City defender. No complaints but a hard pill to swallow. 75 minutes with 10 men against the second best side in the league. A hard task made even harder. The sending off caused a tactical change, with Gary Liddle moving to centre back and Hanson dropping deeper into midfield, to fill the void hole and balance the team. It was only in the last five minutes of the half when suddenly the action picked up. Preston had the first chance with the excellent Daniel Johnson racing through after Billy Knott lost the ball in midfield. After changes in possession it was left to Joe Garner in the box to curl the ball just wide of Williams’ left post. Moments later, it was Stead put through one on one and he disappointingly shot straight at the Preston keeper. That should have been the game changer. All square at the break and City, although lacking in attacking ambition, were seemingly comfortable in defence. You couldn’t tell too much it was 11 vs 10. Preston seemed to lack any conviction in making the extra man count. You can imagine the opening Parkinson’s half time team talk: ‘Right boys, second half. Keep it tight for the opening 10-15 minutes…’ If only. Unfortunately that went out the window barely 30 seconds into the second period. Stephen Darby rashly fouled Jermaine Beckford in the area and Paul Gallagher converted the spot kick at the second attempt with Williams parrying the first effort. And then it was two. 10 minutes later, right midfielder Chris Humphrey cut the ball back and Johnson slotted the ball home beautifully into the keeper’s top right of the goal. It could have been three moments later but Williams saved superbly from a Beckford header. City freshened things up in the last quarter with Mark Yeates, Matty Dolan and Dylan Mottley-Henry coming on for Jon Stead, Gary Liddle and Filipe Morais respectively. At 2-0 there was still a chance and City had a wonderful effort on 80 minutes, with an audacious 30-plus yard lobbed attempt by Billy Clarke which was well tipped over by the goalkeeper. Again, it was the sucker punch moments later when midfielder Humphrey’s deflected shot looped over Ben Williams to send the strong Preston contingent into raptures once again. Hanson was to have a header cleared off the line minutes before the end, but it was not City’s day. I don’t think City played too badly to be honest, and the scoreline was generous to Preston to say the least. They didn’t offer much and, with 11 v 11, it would have been interesting to see how the game panned out. City played some nice football on the deck at times and the central midfield pairing of Liddle and Billy Knott were complementing each other effectively to gain a presence in the middle of the park. Liddle was one of the star players for me, excelling in the makeshift defensive role. On the whole he did a job he was not expected to do and, on the whole, performed it not badly at all. The City fans were also appreciative of the team’s efforts and chanted superbly throughout the match. So here were are with six games left. Unfortunately, it just feels like the gas has run out of the tank. Too many games and that cup run – do we really have the energy and quality to consistently win almost all our remaining games to get to the play offs? It is two wins to get into sixth and then more wins to stay there. 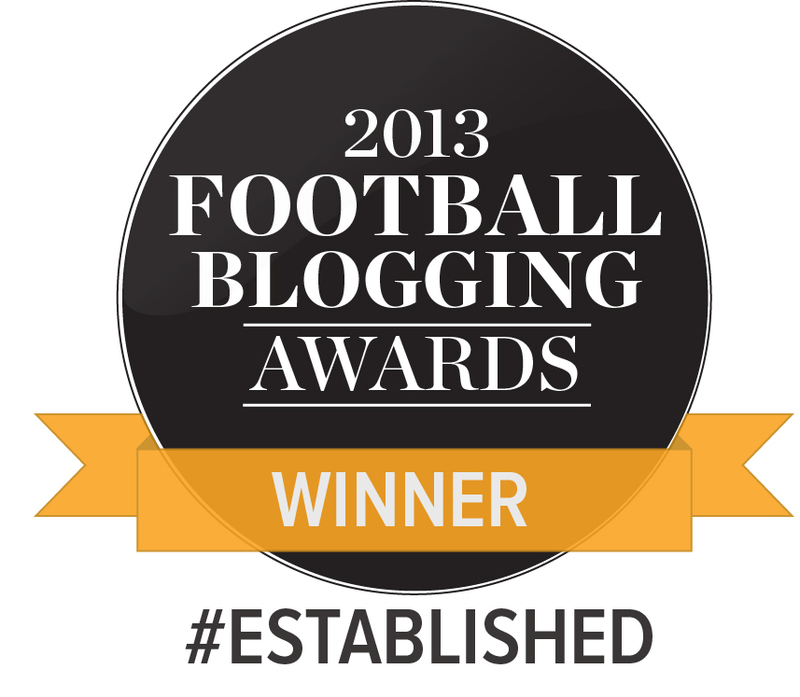 I would love to be proved wrong and you can never write this team off. There have been so many twists and turns this season, and we all hope for one more. But it just feels as though there are too many steps backwards and not enough forwards to bring the season to an exciting climatic end with something to play for. It will be very difficult now. 5 wins will get us there and 4 gives us a small chance although even that looks unlikely but then again who’d have seen Chesterfield winning 4 games on the bounce? Their form prior to that they won 4 and lost 6 out of 10. I must say that I find this article harsh and unfair. Over recent years City has delivered many times when it has come to crunch. The reference to City blowing it ‘yet again’ is unfair in my view. The truth is that Preston is a very decent side who have been in the top two for months on end now and will go up automatically. We are not yet good enough and I think that a promotion this time around would be damaging in the longer term. That said, for some lengthy periods of the game we matched them, even when down to ten men and whatever could go wrong did. It was just ‘one of those days’. For me, it is all about how well Parky is backed in the summer to add some much needed extra quality and depth. I remain convinced that he the nucleus of a side capable of going up next season. I think the sub of Mottley-Henry coming on was the highlight for me and looked like he has bags of energy and pace. I would love him to play more games before the season end and see what he’s made of at this level. Ditto. Glad to see the kid come on in front of a big noisy crowd against a good team and aquit himself well. At one point he went over following a tackle but leapt up and chased on down the by-line instead of rolling around looking for the ref as do many players seem to do. In terms of the game I thought City played really well and 3-0 was harsh. My boss is a Barnsley supporter and told me before the game that Preston will foul regularly around the half way line as all Graysons teams do that. Looking at the foul count they made 19 to City’s 8. To me that says a lot about Preston considering they were playing ten men for over an hour and the ref who seemed a bit weak at several fouls where a yellow was a proportionate response. I thought city played pretty well considering they lost 3 nil…two moments of madness (red card and the penalty) and a deflected shot. Don’t get me wrong, Preston deserved the points but 3 nil was very harsh on the 10 men. And tho’ I was unimpressed with Leeds or Millwall, Reading really sorted us out. The league above will be a huge jump. Although Darby was booked, I think it was actually Liddle who conceded the penalty.